8 Person electric boat for sale, a large capacity electric boat you can buy for your water parks. We have different models of electric boat with 8 seats, if you want to buy some new boats, you can contact us and we also offer customized service like the color, models and appearances of the eight person electric boats. Contact us for price details now! A luxury double-layer inner glass fiber reinforced plastic electric yacht newly developed at the end of 2008. The main hull is made of surface felt, flawless alkali-free glass fiber cloth and unsaturated polyester resin. The surface of the hull is sprayed with high-performance DSM marine gel coat. 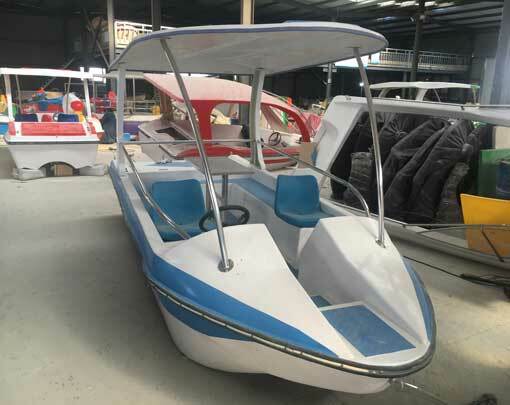 High strength, light weight, anti-aging, colorful, beautiful appearance, simple and convenient maintenance, environmental protection and pollution-free, suitable for water recreation in parks, lakes, reservoirs, etc., concave deck design, very convenient for tourists, easy to operate, can be driven by tourists . The boat body is comfortable and luxurious, and can be customized with the hull color and corporate logo. Drive shaft: The complete set of automotive flexible shafts. The motor and wire of the ship have been connected before leaving the factory. The customer can open the hull and connect 4 batteries (series) to the cabin. When charging is required, the positive and negative poles of the charger are respectively connected to the red and black charging heads on the hull to complete the charging.